Must_love_paper's Gallery: "May your days be filled with love"
"May your days be filled with love"
The sentiment in this card come from CC designs wedding labels stamp set. It is stamped in hero arts silver ink, an is way easier to read in person then it is to read on the photo. 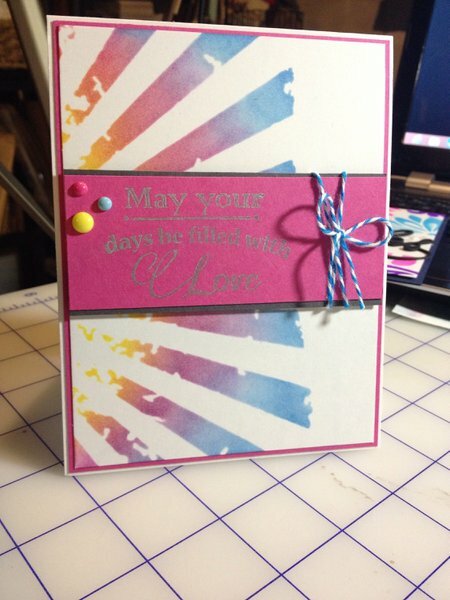 The backround was created with Tim Holtz's sun burst stencil using squeezed lemonade, picked raspberry, and salty ocean distress ink on bazzil marshmellow white cardstock. The inside has the same stencil and in on it just applied much lighter to give it a pastel colouring and makes it easy to write your message over.Thanks for looking.